One of Christian Music’s best known bands, MercyMe, will be at John Paul Jones Arena on October 20th! 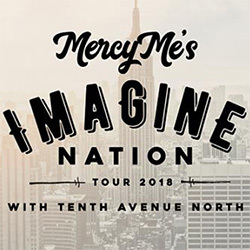 MercyMe’s “The Imagine Nation Tour” will stop at 20 cities nationwide with longtime friends, Tenth Avenue North! 5 time Grammy nominated MercyMe has produced over 9 studio albums and has consistently topped charts and received awards for their unique Christian music.